His foals would be suitable for almost any discipline! : We have his offspring for sale from weanlings to seven year olds! 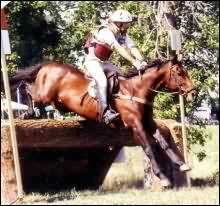 Tingle Tern is the sire of winners at eventing, driving, racing, steeplechasing and endurance racing. He has produced many reliable eventers, foxhunters as well as pony club and 4-H mounts. He has foals out of Arab, Connemara, Hanovarian, Azteca, Quarter Horse, Paint, Mustang, Show Hunter, Draft as well as Thoroughbred mares. All his foals inherit his kind disposition and easy trainability. He himself is the only TB stallion to complete the Old Dominion 50 mile Endurance Ride. He is a regular foxhunter, winning the Genesee Valley Hunt Masters' Cup three times, and a schoolmaster eventer that has taken his amateur owner from Novice to Intermediate. A champion in double harness with his sister, they are in consistent demand to pull a Carriage for Weddings. Please contact us for more information about himself or his offspring.